In Chattanooga, we believe strongly that public art enriches the places and spaces where we live, work, and play. It visually enhances our landscapes. Public art stirs interactions between community members and their environment. It adds artistic and creative dimensions to civic spaces. The first major public art project was launched as part of downtown's 21st Century Waterfront Project, as an unprecedented 1% of the waterfront budget ($1.2 million) was allocated to purchase public art, and resulted in 3 major public art projects, the Light Masts on the Chattanooga Pier, the Native American art installation at the Passage, and the First Street Sculpture Garden. A citizen committee appointed by the mayor was formed to oversee the project. Partner organizations included Allied Arts of Greater Chattanooga, the City of Chattanooga, the Hunter Museum of American Art, and River City Company. 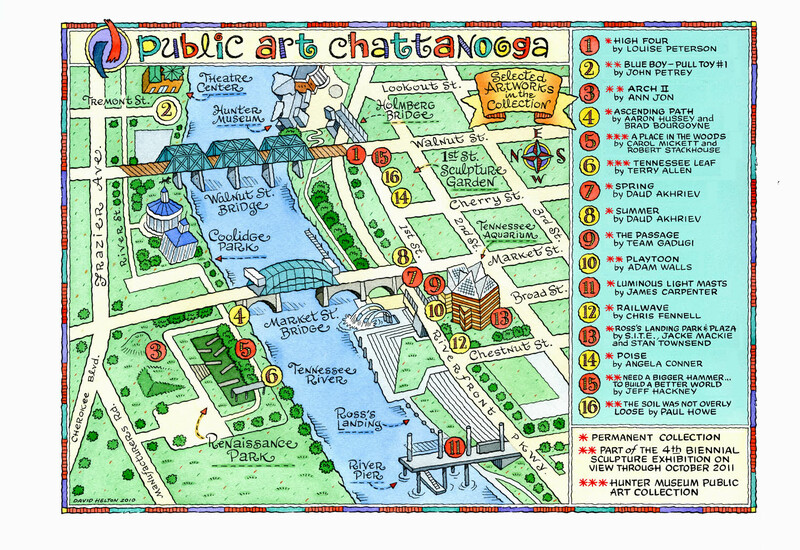 View a walking tour map of some of Chattanooga's public art installations.